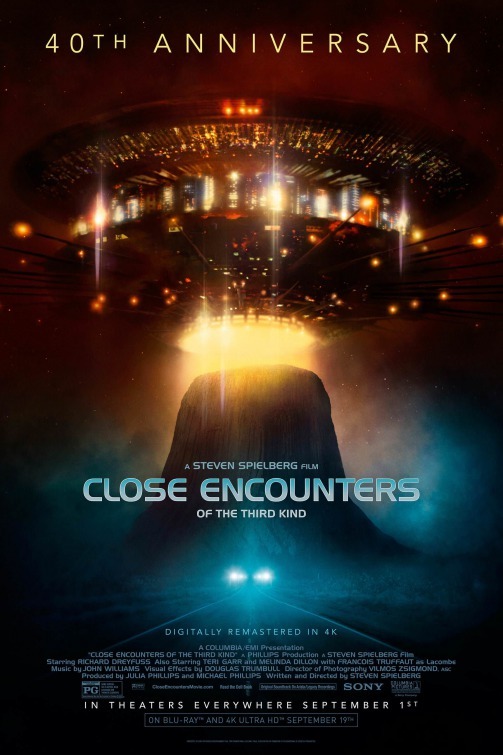 Sony Pictures is celebrating the 40th anniversary of a modern science-fiction classic as it rereleases Close Encounters of the Third Kind to theaters this weekend. The movie, director Steven Spielberg’s follow-up to his breakout film Jaws, tells two stories that eventually converge. Roy Neary (Richard Dreyfuss) is a husband and father who works for the local electrical utility. When widespread outages are reported he goes out to investigate and winds up having a mysterious experience he can’t quite remember or make sense of, but which is with an expedition of aliens that are circling Earth. Meanwhile, a team of scientists and others are investigating a series of mysterious incidents, many of which involve the return to Earth of people, ships and more that have gone missing over the last 50 years. Those two stories come together as mankind makes meaningful contact with alien visitors for the first time. To promote the release, Sony has engaged in a decent marketing campaign. That started with a cryptic teaser titled “This Means Something,” which is a call back to a line Roy repeats throughout the movie as he seeks to figure out what happened to him and why he can’t get the image of a particular mountain out of his head. There was no footage shown, just visuals of an air traffic control display that are played while we hear dialogue from a key scene involving air traffic control and reports coming in from planes in the air. Familiar music plays at the end and we’re asked to visit WeAreStillNotAlone.com, which is just an email newsletter signup conversion form. Later on, a new trailer for the re-release starts out with the traffic control team dealing with the pilots who are reporting a UFO of some sort. We see shots of Roy’s truck shaking before he has his own encounter with the visitors followed by other scenes of him and others seeing the ships and trying to find out what’s happening. After having the different kinds of contact explained to us we’re invited to “Make contact…again.” The pace of the trailer picks up to make it seem like an all-out action movie, which isn’t totally accurate if you’ve already seen it. Still, it sells you on the idea of experiencing the film on the big screen, which is an attractive option. There was also a new poster created. It uses one of the most famous, iconic images from the movie, showing the alien ship descending down on Devil’s Tower. The “40th anniversary” event is touted at the top while the same title treatment from the original release is used further down, followed by the value proposition that it’s been digitally remastered in 4k. Activity on the movie’s Facebook page has also ramped up during this campaign. The page had previously been used only intermittently to occasionally share random stories about the movie or Spielberg but had been largely dormant since November 2015. In the last couple months, though, it’s been sharing the marketing materials as well as offering fan art contests and other reminders of the upcoming theatrical showings. Sony’s been advertising the event online and on social media as well, with short videos that let people know it’s returning to theaters. It’s certainly not at the scale of the marketing of a current release (though it’s actually more substantial than many campaigns) but it has gotten people talking about the movie again, which is a good thing. Whether or not the re-release comes off as successful remains to be seen, but the more people who appreciate what I consider to be one of Spielberg’s top three movies, the better.